Throughout the constellation of Orion one can see wide expanses of hydrogen clouds and dusty regions. 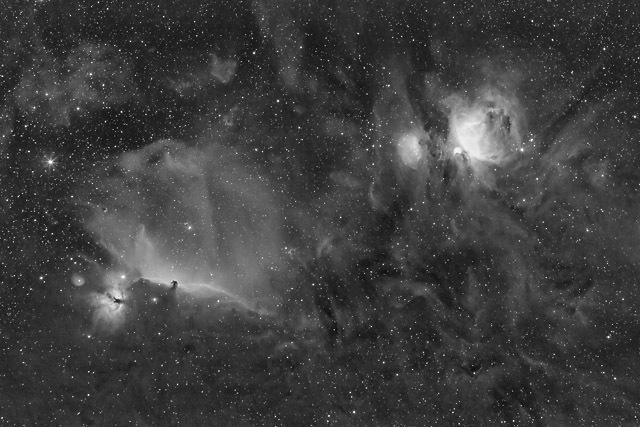 This image is a widefield image covering approximately 6 by 4 degrees of sky between the Horsehead and Flame Nebula at the bottom left and the Great Orion Nebula in the upper right. The photo was taken through a Hydrogen Alpha filter which allows a very narrow band of light through the filter. The brighter parts of this image represent brighter areas where Hydrogen gas is emitting light, and many of the darker regions are areas where dust is blocking the background light. The Horsehead Nebula (Barnard 33) is an example of this, where the silhouette of the obscuring dust looks like a horse's head. Software Used Images Plus 5.0 for camera control, calibration, stacking, digital development, smoothing and noise reduction. Photoshop CS5 used for levels and curves, high pass filter, star shrinking, screen mask invert, unsharp mask, and smart sharpen. Gradient Xterminator for gradient removal. Carboni Tools for additional noise reduction, and smoothing. Focus Magic for focus restoration. Notes This is the first image I've taken through my Canon 200mm f/2.8 prime lens. I'm extremely impressed with the sharpness of this lens, as it is almost perfect across the entire field of view. I had planned to capture more data before processing this image, so the noise level is a little higher than I would have preferred. My intention is to eventually combine this data with some RGB (color) data to make an HaRGB image similar to my widefield 50mm image of Orion.